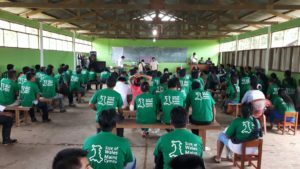 Raising awareness for the rights of forest-dwelling indigenous communities – the forest’s best custodians. With seven million hectares of forests lost every year, it is not surprising that we need (at least!) one day, like today’s International Day of Forests, dedicated to support and celebrate forests. Deforestation is responsible for roughly 25% of global greenhouse gas emissions, the biggest factors contributing to deforestation being agriculture and other land use changes. Forests cover a third of our planet and provide many vital functions for our survival – they host 50% of all land-based biodiversity; they combat climate change and protect us against the impacts of storms and floods; they provide shelter, medicine, jobs, food and security for forest-dependent populations, supporting the livelihoods of 1.6 billion people. More specifically, tropical forests cover about 6% of the total surface of the Earth, stabilise the world’s climate, contribute oxygen to the atmosphere and maintain the water-cycle. They are also home to some of the most vulnerable indigenous communities around the world. One such community is the Wampis Nation of Peru, a group that Size of Wales is proud to support with our partner’s Forest Peoples Programme. 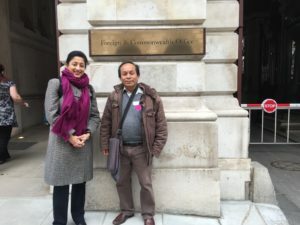 I recently had the privilege of meeting Shapiom Noningo Sesén, Technical Secretary of the “Autonomous Territorial Government of the Wampis Nation”, during his visit to Europe to raise awareness of the plight of the indigenous peoples to policy makers and politicians. The Wampis Nation have a population of around 15,000, living in the Amazon rainforest with a territory spanning 1.3million hectares (just short of the size of Wales of 2 million hectares!). They make up one of the millennia-old nationalities of the Peruvian Amazon. They have maintained some of their key cultural characteristics including language and sociocultural practices such as taking herbal plants from the forests for their rituals to obtain visions and strengthen the body. 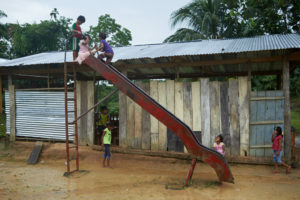 They currently live in concentrated settlements, with the vast majority practising subsistence agriculture for their own consumption, as well as some who generate a basic family income from the three principle economic activities: cultivating organic cacao in fallows (secondary forest), operating household fish farms, and growing bananas. Whilst the Wampis are a unified community, there are a number of factors which are causing cultural changes and adversely impacting their sense of identity, such as the loss of pivotal cultural knowledge around the use of nature and forests, migration to the big cities (to study, work and other factors), and a risk of losing their own language. Add to this the illegal logging, mining and palm oil plantations taking place on their territory and the Wampis’ future is facing threat. The creation of the Autonomous Government for the Wampis (Wampis-GTA), whose principle aim it is to seek formal recognition of the rights and autonomy of the Wampis people, has been a very positive step towards empowering the community to protect their identity, their heritage and their livelihoods. Prior to the formation of Wampis-GTA being set up the Wampis had no say on what happened to their territory. 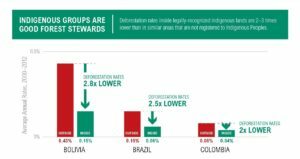 As recent research from World Resources Institute has shown, indigenous peoples are one of the best custodians of our forests with deforestation rates significantly reduced where they have legally recognised lands. He also shared the thanks and surprise expressed by his community when they learnt that people from Wales, many thousands of miles away, where supporting the cause in solidarity with the Wampis nation. With thanks to the generous support of people of Wales, we have been able to protect an area of tropical forest twice the Size of Wales – that’s roughly 4.5 million hectares! On this International day of Forests, I would urge you to take heed of the following quote, donate and support us in sustaining the livelihoods of those who depend on the forests – and don’t forget, every £1 donated will be doubled through our match-fund.